Join us for an all ages, family & kid friendly event at our neighborhood pottery studio. 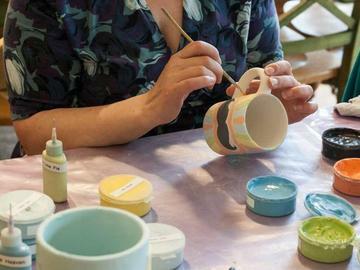 Each ticketed attendee will complete a painting project of a mug, plate, or bowl. Glazed and fired pieces will be ready for pickup a week later. We'll have bagels and beverages (mimosas, too!). Hang out with neighbors, experience a local business and create a masterpiece. The Expressive Hand is owned and operated by Bella Vista resident Marcie Ziskind. Marcie has generously offered the use of the entire studio to BVNA and a special discounted rate for this event. This local business has supported the Sidewalk Cleaning campaign in 2018 & 2019. We appreciate their support and hope you support them too! Ticket price covers costs only and we will be accepting donations towards the 2019 Sidewalk Cleaning Campaign at the event. The neighborhood cleaning initiative is funded 100% by donations - show your appreciation for cleaner streets and give generously.